Historic lower Manhattan has so many things to see and do. Knowing how to get around for free makes it even more fun. Many parts of lower Manhattan have transformed from commercial to a heavily residential area. Buildings that once housed large banks and corporations now feature unique apartments that take advantage of the tall ceilings and impressive lobbies. New construction has added units to the market as well, including the Frank Gehry-designed building on the east side of island, one of the tallest residential buildings in the world. Visitors to this area can benefit from knowing about these free transit options — on land and on the water. Commuters and tourists know the Staten Island Ferry is one of the best ways to experience the imposing New York City harbor. The 25-minute trip to Staten Island, which has been free since 1997, skirts the Statue of Liberty offering frugal tourists a cheaper and faster alternative for getting a photo of this famous landmark. A round trip from Manhattan does require passengers to disembark on Staten Island before getting on the next ferry back. During this rush maneuver, one can miss the amazing aquarium tanks at the Staten Island terminal featuring exotic fish so mesmerizing that you might miss the next boat back. Starting in 2017, tourist and visitors might not rush back to Manhattan given the planned opening of the New York Wheel. Like its brethren, the London Eye, the NY Wheel is sure to draw plenty of visitors and offer stunning views of the New York skyline. The NY Water Taxi's IKEA water taxi shuttle is another great way to see the New York harbor. The 25-minute trip starts on Pier 11, Slip A in the east side of lower Manhattan and cruises along the Brooklyn coastline. The shuttle is free on weekends with reasonable weekday fares. Riders can choose to disembark at one of two stops in Brooklyn, the Red Hook Dock on Van Brundt Street and the IKEA dock. The trip can be quite refreshing in the summer time when New York is sweltering and the marine breeze feels so much cooler. When reaching the Brooklyn stops, the Verrazano Bridge becomes an imposing view as it stands tall at the edge of the bay, a gateway to the Atlantic Ocean. A great photo opportunity. Of course, riders can immediately take the ferry back, but Red Hook offers many spots worth investigating. Museums, restaurants and bars, art galleries are within walking distance and anchored by the IKEA superstore, which features a large cafeteria-style restaurant featuring – could it be anything else? – Swedish meatballs. For a cheap-eat, try the delicious BBQ baby back ribs with corn bread, when available. For a detailed overview of other places to visit in Red Hook, Michael Hsu's thirteen-part Must-See Red Hook is an excellent guide. The Downtown Connect shuttle loops around lower Manhattan making 37 stops in a U-shape route. This services is relatively unknown to most New Yorkers, but offers an excellent way to tour lower Manhattan and all for free. Service is available seven days a week, except Thanksgiving, Christmas Day and New Year's Day starting at at 10 AM and a final run at 7:30 PM. Buses arrive at 10-minute intervals on weekdays and at 15-minute intervals on weekends, but electronic signs provide approximate wait times. Tracking information is also available on the web and mobile devices, such as the live route and bus tracking shown below from Nextbus. This screenshot below shows the route: red dots represent stops and selecting a stop will provide approximate wait times. Screenshot of tracking map. Red dots represent stops on route. Governors Island is a 172-acre island in the heart of New York Harbor. Minutes away from lower Manhattan and Brooklyn, it's accessible by ferry and open to the public during the summer. The weekend ferry is free in the mornings, other times is costs $2 per round trip. There is no additional charge for bicycles. The island offers many outdoor activities and is fun for the whole family. I enjoy getting to know this fabulous city and I hope these free public transit services make the exploration of lower Manhattan and the harbor equally enjoyable for you. There are two infrastructure projects underway on the Upper East Side. One of them is quite obvious on Second Avenue. (See: NYC Underground: New Transit Projects.) There, the new subway line installation requires massive equipment. A high level of street-side disruption is clear. Sidewalks, crosswalks, and businesses along the thoroughfare are greatly affected. Along Third Avenue is the second infrastructure project. It is so unobtrusive that most people are unaware that it is already active and running. Of course, I am writing about the ambitious LinkNYC Public Wi-Fi program. The LinkNYC web site explains that in 2014, the mayor's office announced a competitive request-for-proposals to reuse the ubiquitous pay-phone infrastructure to offer New Yorkers free Wi-Fi and phone calls. The city awarded CityBridge, a consortium of technology, media, user experience and connectivity companies, a 12-year franchise. LinkNYC offers super fast Wi-Fi — a hundred times faster than average public Wi-Fi — across New York City connecting about 7,500 kiosks. The free service will be supported with advertising. LinkNYC has also been rolled out along Eight Avenue and will continue to expand in Manhattan before heading out to the other boroughs. A LinkNYC map provides information on kiosk locations. Connecting is quite simple and anecdotally, speeds have been impressive. See the video below explaining how to connect to LinkNYC. Happy surfing. Going to an open house can be a hit-or-miss situation, but if you go prepared with the right questions, even an overcrowded affair can be useful to assess the unit with the few minutes you get with the listing agent. It is likely that that agent has done a fair amount of research in preparation to list the apartment. This may be your best opportunity to benefit from that agent's research while in the apartment. Here are six topics that I want my customers to understand during an open house visit. You are trying to question the agent running the open house for the good and the bad, and possibly the ugly about the property. To describe what he or she thinks is the key selling point of the unit. You are looking for what they have assessed as the unit's best value or feature. Is it the price, the space or layout, or the view? The agent's response will help you understand how the unit is being marketed against comparable units. To enumerate any specific financial requirements from the coop board. Does the building require a specific debt-to-income ratio? Or, does the board look for a liquid reserve of two year's worth of maintenance and mortgage post closing, or more? You are trying to get a feel for how tough or difficult the board approval will be. To reveal any surprises such as a soon-to-be-announced maintenance increase or assessments for a building capital improvement. To assess how the agent arrived at the listing price and seller's negotiability. The agent should be able to offer comparisons with recent sales in the building or nearby. You want to understand if the unit has been priced high, or does the agent think the unit is priced to sell quickly. To highlight valuable amenities. You are looking for what the agent considers worthwhile amenities so you can ignore a gym that is dark and dank in your evaluation. A roof deck sounds most appealing as long as it isn't next to a loud a/c. Only amenities that add value to the apartment should be taken into account, such as a good-sized storage bin, or a well-run pool. Too many buildings list amenities that don't add any value. To provide insight into the building's reputation. You want to understand how the board, the managing agent, and super work as team. You want to question how the agent feels about the building's staff and how they conduct their duties. Ask if the super lives in the building and runs a tight ship or does the agent hint at a staff that is jaded and unresponsive. Some of these topics may need to be addressed indirectly and subtly, but if you get good responses, by the end of your visit, you will have a better feel for the unit's value. If any of these questions are unanswered after the open house, they should be the basis of follow up research. The most recent report (February 11. 2016) from Freddie Mac's Primary Mortgage Market Survey shows 30-year-fixed mortgage rates hitting 3.65%, near the 2015 low of 3.59%. Experts expect the rate to continue south, but whether we approach the 2012 historical lows (3.3%) is to be seen. The lower cost of financing homes along with an improving labor market will offset home price increases expected this spring. Assuming global instability doesn't turn for the worse, I expect a robust spring in the Manhattan and Brooklyn apartment sales, especially in the $1M-5M market. The best way to shop for a mortgage loan is via a mortgage banker. Please contact me if you need a referral. Apartment 3G is now in contract. How did we search for information before the internet? I have a listing — a great studio — at the Parc Vendome Condominiums on West 56th Street, a building known for its amenities such as a private dining room with a butler's pantry, a music room, a billiards room, and to top it off, an English Garden. What is a butler's pantry you might ask? Well, that's easy. It's a transitional service room between the kitchen and dining room used for storage. The room a butler would have used in the times of butlers. Or you can select the link to butler's pantry to get a fuller definition from the internet. The English Garden at the Parc Vendome is nestled between the four pre-war buildings — two on each side — that make up the condominium complex with over 500 dwellings. This English Garden trades in the traditional lake for a beautiful fountain. I learned about the traditional lake when I looked up English Garden on the internet. And so it goes. The English Garden at the Parc Vendome. Aerial view via Apple Maps. My listing at 353 W 56th is apartment 3G. A potential buyer asked me if I knew about the comic strip, Apartment 3-G. I had not heard of this comic strip. Of course, I went home and did a little research on the internet. And sure enough, I learned that it was a soap opera comic strip created by Nicholas P. Dallis with art by Alex Kotzky that started its run on May 8, 1961. It is about a trio of career women who share the eponymous Apartment 3-G in Manhattan. The three main characters were loosely based on real actors: Tommie is based on Lucille Ball, Margo on Joan Collins and Lu Ann on Tuesday Weld. Kotzky's artwork is carefully drawn, realistic from a more elegant time. While these characters would have appreciated the 20s and 30s pre-war elegance of the Parc Vendome, my listing is likely a tad too small for all three, even if you converted the large closet — as others have done in this line — to a small alcove. After the deaths of the original creators of Apartment 3-G, others have taken up the comic strip. It is still running today, but it has none of the sensibilities of the original artwork. ​If you want to revisit that elegance, I would be happy to schedule a private showing for apartment 3G at the Parc Vendome. The new year has taken off like a rocket. I can't believe that today is MLK day. I already miss the bustle and energy that surrounds my children and friends who visit during the winter break. Most have returned to begin the spring semester at their respective colleges. But, I am also glad to be back working with clients after taking a couple of weeks off at the end of the year to focus on family and holiday events. I cherish this time with family and friends, and it motivates me to do more in my professional life as well. This past week I had the opportunity to share what I do as a real estate broker with a group of a dozen students from the Grace Institute that visited the Douglas Elliman mid-town office. The Grace Institute is a workforce development organization that helps women-in-need find their calling. It is a wonderful organization that I have followed and supported for years. I shared a bit of my life story as it relates to selling real estate. I told them about my family and my schooling. I told them about my grandfather's natural food store in Queens—one of the first of its kind in New York in the early seventies. There, I absorbed many lessons on customer care. I described how I loved working the register, composing trail mixes, and helping customers even though I was only in junior high school. After some personal anecdotes, I described what I do as a real estate agent in the greatest city in the world. I explained the difference between co-ops and condos. I shared with them that the most challenging, but rewarding task was negotiating on behalf of my customers. I also described how I help my customers compile the extremely complicated board packages that all buyers have to submit to co-op boards in order to get approval to purchase the apartment. I explained that buying a co-op was more like applying for membership to an exclusive club. I discussed the serendipity of apartment searches, the explorations during showings, and how I often get to know my customers really well, many becoming repeat customers. I also explained how brokers work on commissions and that it is possible to invest many hours with clients that never purchase or sell an apartment. That was an opportunity to explain how important it is to stay positive and to be resilient. The women asked a lot of questions and I was quite pleased and relieved with how things went. The next day, I was pleasantly surprised when I received a handful of wonderfully worded thank-you notes from students. The notes were a nice touch and most generous. They made my day knowing I had made an impact. What a nice way to start 2016. The Real Deal recently ran an article on this map of New York. The map, from around the turn of the 20th Century, is exquisitely detailed by the illustrator, Josef Klemm. His map is a bird's-eye view of the city before the rise of the skyscrapers. The map is meticulous enough that one can spend hours focusing on the details. Below is a screen grab of Central Park and surroundings. Maps like these are enjoyable to explore and many such maps are accessible from the expansive David Rumsey Map Collection. Map enthusiasts are likely to be aware of this source, but if you are not, it is worth checking out. The online collection houses over 150,000 maps. For example, doing a quick search for New York City maps, I found this map from 1926 by Charles Farrow titled, "A Map of the Wondrous Isle of Manhattan." A Map of the Wondrous Isle of Manhattan by Charles V. Farrow, 1926. Source: David Rumsey Map Collection. Below, I share some highlights. First, the map's medallion has such nice touches, including the warning, "The scale is all askew," which is true. An elevated train circles the medallion's top border and a subway is below ground on the bottom border. The couples from the Roaring Twenties add to a feeling of the Jazz Age. This is the kind of map that could be used as the background for an opening sequence for a movie adaptation of The Great Gatsby. Another detail is the northwest corner showing the Cathedral of St. John the Divine and Columbia University. 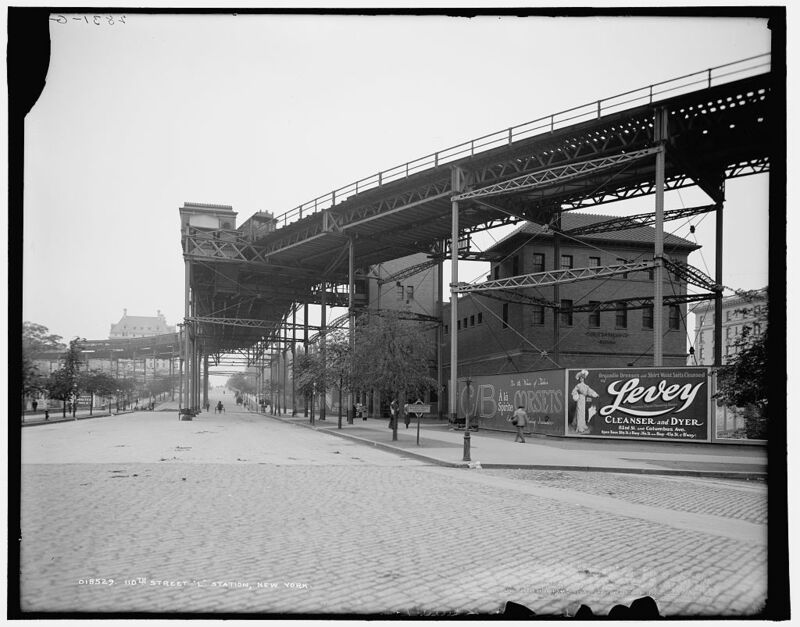 It also shows the infamous S (for Suicide) Curve of the Ninth Avenue El (see photo). The title medallion from A Map of the Wondrous Isle of Manhattan by Charles V. Farrow, 1926. Source: David Rumsey Map Collection. The northwest corner from A Map of the Wondrous Isle of Manhattan by Charles V. Farrow, 1926. Source: David Rumsey Map Collection. The map's border also caught my attention. The strip of antique cars and pedestrians is energized and active. You can see why the pedestrians need to move out of the way—fast. The whimsical drawing reminds me of the illustrations in old Monopoly sets. I hope you take some time to look around these two maps and the full Rumsey collection, just make sure you have a few hours. I am glad Thanksgiving Day is around the corner. It is my favorite holiday, certainly a holiday that allows a little time to reflect on the positives and not on the barrage of disturbing events dominating the news. This year I am without a stove because of a building gas leak. For the first time in over 25 years, I won't be spending all of Thursday in my kitchen preparing food. I will miss the early morning turkey preparation, stuffing it, and then putting it the oven before most of the kids and family guests have gotten up, but I hope that taking a break from the usual will give me an even greater appreciation that Thanksgiving is about family and friends. My usual guests are visiting other family members or staying put. I am sure they will also reflect on the change in the routine, even my nephew who has decided to travel to Thailand during the holiday. While I won't be busy in my kitchen, I did get my fill of cooking this past Friday, cooking for 100 at the St. James Church on the Upper East Side. Of course, when you prepare a meal for 100, it is never a solo task. With friends and family helping alongside program chair Faith Fraser's regular team we served a delicious three-course plated meal for people in need. Below, some photos taken by Emily and Brook, clearly show our joy and fun. After the salad was served, Faith pulled me out from the kitchen to introduce me to the guests in the dining room. She usually does this and it feels nice to get the appreciation. Friday night, she also asked me to say a few words about the meal. On the spot, I was able to convey that what I had cooked was one of my family's festive meals, usually prepared around Christmas. I mentioned how the meal was my son's favorite and how I had learned it from my grandmother. The sfingi I was preparing for desert took a little explaining, but when I compared it to a zeppole, I could hear some acknowledgements. I said nothing special other than sharing our family story and headed back to the kitchen. Later, during cleanup, some guests asked Faith if they could thank me in person. Because the guests are not allowed in the kitchen, I stepped out to meet them. I was surprised that they wanted to thank me for sharing the family story and how much it meant to them that I had shared my traditions with the group. They also wanted to share their own stories reminding me of the amazing power of story telling to unite. Last year, I released a blog post with the recipe for our favorite Thanksgiving staple, Nana's Pumpkin Bread. We will certainly miss that treat this year. I hope some of you reading this might try the recipe and comment on how delicious it came out. Here's a quick slideshow showing the steps from preparation to heaven-with-milk. Savor the moments with your friends and family. Wishing all of you an enjoyable and relaxing Thanksgiving Holiday.